Crisis Centre announces annual fun run and welcomes community members to register or participate as a sponsor. 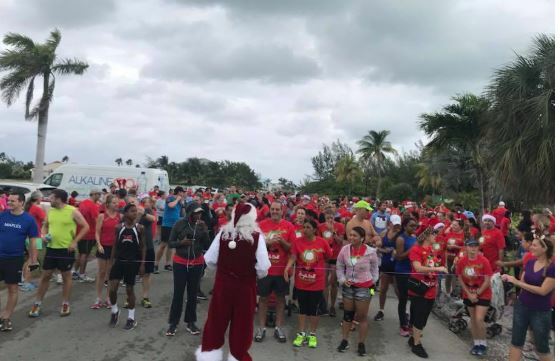 Cayman Islands Crisis Centre (CICC), a charity organization that provides support and shelter to victims of domestic abuse, is hosting its annual Jingle Bell 5K 10K Walk/Run. The race, now in its 16th year, will take place on December 9, 2018, with the start and finish at Holiday Inn, Safe Haven. After the race, participants will get breakfast and pictures with Santa, all included within the registration fee. All proceeds from the event will be used to towards building a new shelter and services of the CICC to support the needs of domestic abuse victims. Sponsorship packages are still available for companies and potential patrons, wishing to contribute. “The Jingle Bell run is always a fun occasion, with many walkers and runners donning festive gear for the race. Last year we saw over 500 participants and this year we hope to top that. As always, we are grateful to our sponsors. Without their generosity we would not be able to host such a successful event which supports our non-profit service to the Cayman community”, said Michelle Lockwood, CICC Board Member and Chair of the Fundraising Committee. Registration for the event on www.caymanactive.com/jingle.